Colonies are an important economic factor as their goods can be sold on the market. Factories are an alternative source of income, because they generate profits when processing goods taken from the market. With their shipyards players build new ships, and with their churches they recruit new workers. Ownership of workers is necessary to found new colonies or to erect new buildings. A worker must be paid in order to acquire privileges. Privileges augment the victory points (VPs) which can be earned in five categories. On the player's sheet, the basic VPs for each category are shown on the first line, and the privileges are placed in the lines below. The situation depicted aside would mean that the player gains 1 VP per colony, 2 VPs per factory, 5 VPs per explorer, 7 VPs per shipyard, and 3 VPs per church. In addition, each worker, ship, and full amount of 200 Cruzados earns one extra VP. After the last sea region has been explored, or the last building has been taken, one final round of turns is executed. The player with the most victory points wins the game. 1 Market: Here the prices for sugar, gold, and spices are marked with a wooden cube. All three prices start in the fourth line from above, which is a little lighter than the others. To the right are the revenues from using factories which receive no marking. (2) Players: Each player starts with 2 ships of his color in the sea region "Portugal", 3 workers in Lisboa (the piece marks the field "3"), and his octagonal game stone on the rondel. The starting equipment of red is illustrated below. In addition each player receives 200 Cruzados, a King's privilege and his other 5 ships into his personal supply, together with his player sheet, which contains 1 starting factory (orange), 1 shipyard (brown), and 1 church (grey). This is illustrated to the right. 3 Colonies: The colony tokens for sugar (9x), gold (11x), and spices (13x) are turned over with their prices down, shuffled well, and distributed on 12 hidden stacks depicted on the game board. 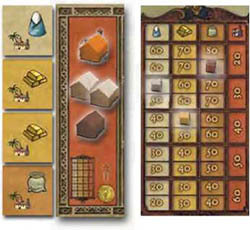 Each position on the board shows whether the stack should contain 1,2, 3, or 4 colony tokens. 1 token of each type remains; they remain hidden and are taken out of the game. The illustration below shows the stack of Timor, containing 2 hidden spice colony tokens. 8 Rondel: Players choose their actions by moving their octagonal game stone in clockwise direction around the rondel. On every turn, one of the next 3 fields can be chosen free of charge. Moving further costs 1 ship per additional field. The first position on the rondel is chosen freely. 9 Scoring track: The scoring track running around the game board is used for the final calculation of victory points. The game ends after either Nagasaki has been explored, or the last building has been built. 10 Game Phase After a red borderline has been crossed for the first time, the game enters its next game phase. Beginning with the next turn after exploring Cabo da Boa Esperanpa, the ships of all players may sail up to 2 regions wide, and additional workers & ships will cost 200 Cruzados each. In addition, with every new game phase the number of privileges at the gallery is replenished. The new number of privileges depends on the number of players and is depicted inside the small chart to the right of the gallery. 4 Gallery: Every arch inside the gallery receives one respective privilege. 5 Regions with extra loss of ships: A token indicating that 2 ships are lost is placed at Nagasaki, and with only 2 or 3 players in Macau as well. 6 Explorers: All 12 sea regions except Portugal receive an explorer (round wooden disk) on their compass rose. The example for Macau is depicted to the left. Market: In the fourth row from the top, cubes marking the prices for sugar, gold and spices are placed. 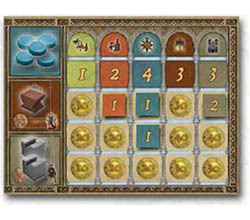 Players: Each player starts with 2 ships of his color in Portugal, places his worker in Lisboa inside the column showing "3", and his game stone onto the middle of the rondel. In addition everyone receives 200 Cruzados, a King's privilege, the other five ships into his supply, and a player sheet which is equipped with 1 factory (orange), 1 shipyard (brown) and 1 church (grey). Colonies: Each region receives a hidden stack of randomly shuffled colony tokens. Privileges: One privilege of each type is put inside each arch of the gallery. Dangerous sea regions: In Nagasaki (with 2 and 3 players in Macau as well) a token for the extra loss of ships is placed. Explorers: Each sea region except Portugal receives a teal round wooden disk. Buildings: In the lower right corner of the game board the buildings are placed: Inside the upper three lines 6 factories each for sugar, gold, and spices, and inside the lower 2 lines the remaining shipyards and churches from left to right (with more than 2 players, the most expensive fields are left free). The players execute another in clockwise seating order. A turn is chosen by z placing the octagonal game / stone on the circular / rondel depicted and indicated action. In the first turn the position on the rondel is chosen freely. On each following turn, the game stone moves forward on the rondel in clockwise direction. When moving forward, any of the next three fields ahead can be chosen free of charge. If the game stone moves further than three fields, each additional field has to be paid for with 1 of the player's ships, which is taken from any position on the game board back into the player's personal supply. It is not allowed to stay in the same field twice in a row; executing the same action on two consecutive turns would require moving forward 8 fields, and paying 5 ships. Several game stones in the same position on the rondel do not affect each other. Example: The game stone is on "Sailing" and could move from here to "Workers", "Market", or "Colony" without cost. In order to enter "Privilege" the player would have to take back 1 ship, to enter "Ships" 2 ships etc. The game runs in three phases and starts at phase I. Phases II and III are triggered after the sea regions of Cabo da Boa Esperanca or Malaca have been explored. The borderline to these regions has a red color instead of blue. After the starting player has been drawn by lot, the last player (sitting to the right of the starting player) receives the playing card "Navegador". This card allows for combining any turn with an additional sailing action. When used, the card is then passed to the player's right. In the very first round, however, the Navegador card cannot be used. The player may recruit one new worker per church owned for the price of 50 Cruzados each. Additional workers each cost 100 Cruzados per game phase (for instance 300 Cr. in phase III). The new number of workers is tracked on the chart at Lisboa and the costs are paid to the bank. The minimum possible number of workers is 2, the maximum is 9. Example: A player with 2 churches may recruit up to 2 new workers for 50 Cr. each. For 2 workers he pays 100 Cr. to the bank and moves with his marker in Lisboa 2 positions to the right. If he wants 3 new workers in game phase II, he would have to pay 300 Cruzados (2x50+200). If a player already has 9 workers in Lisboa, he cannot receive more. In this case his churches may recruit virtual workers for 50 Cr. each, which are sold instantly to the bank for 100 Cr. each, resulting in a net gain of 50 Cr. per worker. It is necessary however to pay 50 Cruzados per worker in church beforehand. Example: A player owns 8 workers and 3 churches, he pays 150 Cruzados for 3 workers. His worker in Lisboa moves to column "9". For the remaining 2 new workers he receives 200 Cruzados out of the bank. For ships the same prices are applied as for workers. The player may build as many ships as he has shipyards for 50 Cruzados each. Additional ships each cost 100 Cruzados per game phase paid to the bank (100 in phase I, 200 in phase II, 300 in phase III,). All new ships are placed in the sea region of Portugal. If a player already has all his 7 ships on the game board, he cannot receive more. Additional ships in shipyard are sold instantly to the bank for 100 Cruzados each, after having paid 50 per ship beforehand. The player may sail with all his ships into a new sea region. In game phase I a ship can cross only one border (blue or red) in order to enter an adjacent region. In phase II it may cross up to two and in phase III up to three borders during a single turn. Several ships in the same region, regardless of their owner, do not affect each other. 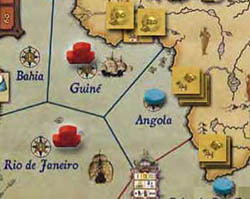 Example: Red has 3 ships in Portugal plus 1 ship in Guine, and the game is in phase II. The ship from Guine sails to Cabo da Boa Esperanza. It is the only one which can reach that region as all ships can cross no more than 2 borders in phase II. 2 ships from Portugal sail to Angola, and 1 ship to Bahia. receives a bonus from the bank, amounting to the price for the cheapest revealed colony. The newly revealed colony tokens are displayed face up at the region. It is not possible to explore more than one new sea region per turn. When exploring sea regions marked with the token for double loss of ships (Nagasaki and maybe Macau), the player has to take back 2 ships instead of 1 into his supply. Accordingly, he needs at least 3 ships to enter that region. Example: Red sails from Guine and Rio de Janeiro into the hitherto unknown sea region of Angola. He loses 1 ship, takes the explorer disk on his player sheet, and reveals the colonies stacked in Angola. As the cheapest colony in Angola would cost 70 Cruzados, he is paid a bonus of 70 Cruzados out of the bank. and two workers in Lisboa. It does not cost ships or workers to found colonies, but every ship and worker can be used only once per turn. 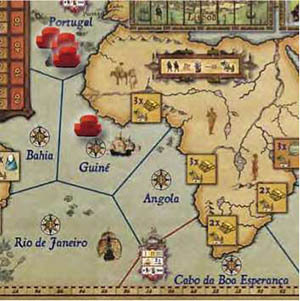 For instance, to found 2 colonies in one region at the same time, the player has to be present with at least 2 ships in that very region, and to own at least 4 workers in Lisboa. Spices (brown): from 60 to 180 Cruzados. If a player has the choice, he will always found the cheapest colony, because apart from their price colonies of the same type do not differ. 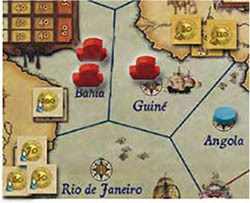 Example: Red has 6 workers, 2 ships in Bahia, and 1 ship in Guine. He can found only 2 colonies, one in Guine (80 Cruzados) and one in Bahia (100 Cruzados). He pays 180 Cruzados to the bank and takes both colony tokens in his supply. If he had 2 ships in Guine, he would be able to found 3 colonies if he could afford them. He cannot found colonies in Rio de Janeiro because he has no ship there. If he had only 3 workers, he could found only 1 colony, because every new colony requires the ownership of 2 workers. 5 workers per new church. His number of workers has to be sufficient for all new buildings together. The number of workers in Lisboa remains unchanged, as it does not cost workers to build. Example: The player has 7 workers and the available buildings are depicted above. The player could for instance build 1 gold factory and 1 shipyard; in this case he would pay 220 Cruzados to the bank (70+150). He could as well build 2 gold factories, or 1 gold and 1 spice factory, paying in both cases 170 Cruzados. But as he has only 7 workers, he could not build 2 shipyards (4+4=8). If he wanted to build a church, he could not build a second building at the same time. The player may sell goods with his colonies and take goods from the market to process them with his factories. The number of colonies and factories remains unchanged when selling or processing goods. For each colony 1 respective unit of goods may be sold on the market. For each unit sold the player receives its current price on the market. After that, the price marker moves down as many fields on the market as units have been sold. If the price marker reaches the bottom line it simply stays there, but further sales of units are still possible. Example:The player owns 3 gold colonies and sells at the depicted price of 50 Cruzados (although the current price is covered by the marker, it still can be read because every number occurs twice). He receives 150 Cruzados (3x50) out of the bank and the price marker moves down onto the upper "30". If the player would sell from 5 gold colonies, he would receive 250 Cruzados and the marker would reach the bottom line. The next player on the market would now receive only 30 Cruzados per sold unit of gold. For each factory 1 respective unit of goods may be processed. White factories process sugar, yellow factories gold, and brown factories process spices. The starting factory (orange) works as a wildcard and can be used to process 1 unit of any type free of choice. For each processed unit the player receives income from the bank of as many Cruzados are shown inside the red column corresponding to the price marker's current position. Illustrated here is a price of spices of 60, resulting in income of 40 Cruzados per spice factory. After receiving the total income, the price marker moves a number of fields up equal to the number of units that have been processed. If the price marker reaches the highest line of its column it simply stays there, but further processing of units is still possible. The decision whether to sell or to process is taken separately for every type of goods. It is possible to sell one type and process the other, but it is not possible to process and sell goods of the same type at the same time. Of course players may decide to sell or process only a subset of the possible units, in order to influence the prices on the market for their future plans. Example:The player's 4 colonies and 4 factories, along with the current prices on the market, are depicted above. He sells 2 units of gold for 50+50=100 and 1 unit of spices for 80 Cruzados. Gold and spices thus cannot be processed in the same turn. Thus his spice factory cannot be used and his orange factory may only process sugar. He processes 3 units of sugar receiving a revenue of 3x30=90. The total payment from the bank is 100+80+90=270 Cruzados. The new prices are depicted to the right. Alternatively, the player could choose to not use his factories at all, but to sell 1 unit of sugar instead. Thus he would collect 40 Cruzados less from the bank, but prepare the market for better revenues of sugar factories in the future. 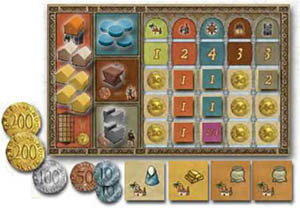 On top of the game board is a gallery with five different historic persons, whose privileges give a cash bonus at once and victory points (VPs) at the end of the game. The player loses 1 worker in Lisboa and chooses one privilege currently available on the game board in return. The privileges reward the possession of (from left to right) colonies, factories, explorers, shipyards, and churches. On every turn, no more than only one privilege token can be taken. The privilege is placed onto his player sheet in the highest possible position of the appropriate column showing a bonus, which decreases with every additional privilege. The newly covered bonus is multiplied with the number of respective achievements (colonies, factories, explorers, shipyards, churches) and the result is paid to the player from the bank. Each player can take no more than 3 privileges per type during the game. If a player has only 2 workers, he cannot take a privilege either, because players must always have at least two workers in Lisboa. Example: The gallery still contains every type of privileges. The player pays with 1 worker and takes a church privilege. As he already owns one privilege of this type, the new privilege is placed in the second position from above, showing a bonus of "40". For his 2 churches he receives a bonus of 80 Cruzados (40+40) out of the bank. If he had taken an explorer privilege instead, he would have received 5x20=100 Cruzados, and for a shipyard privilege 50 Cruzados. In the first column the respective bonus would have been 30 per colony, and in the second column 20 per factory. The game starts in phase I. After the exploration of Cabo da Boa Esperanza the game enters phase II, and after the exploration of Malaca it enters phase III. This is emphasized on the game board by red borderlines (instead of the usual blue ones), and by a small diagram showing the phase numbers which now change. The diagram for phase II to the right shows that all ships may now sail up to 2 regions per turn, and that additional workers and ships now cost 200 Cruzados each. In phase III all ships may sail up to 3 regions, and additional workers and ships cost 300 Cruzados each. The new phase comes into effect on the next turn, therefore the old sailing distance is still applied to all ships in a turn where a new sea region is explored. At the beginning of a new phase the privileges are replenished depending on the number of players. 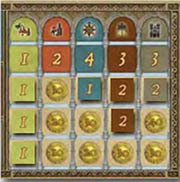 The depicted chart on the game board shows to which number the privileges are replenished. With 2 players, top line, every new phase starts with 1 privilege of each type. With 5 players, bottom line, phase II starts with 2 privileges, and phase III starts with 3 privileges of each type. 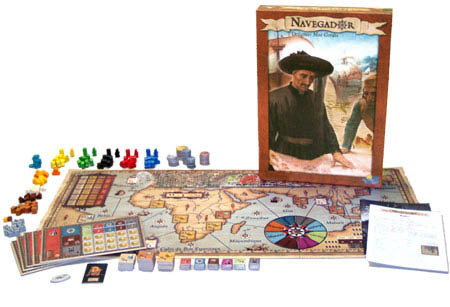 The "Navegador" card allows for an extra sailing action immediately before any player's turn on the rondel. After being used once, the card is given to the player sitting to the right. For this extra action the usual rules for sailing are applied. In particular, the card may be used to explore an unknown sea region. Thus in combination with a regular sailing turn even two explorers can be taken before the next player makes his turn. If using the Navegador leads to a new game phase, the new phase has already come into effect with the regular turn on the rondel. If the card is not used within one round circling around the rondel, it automatically expires. 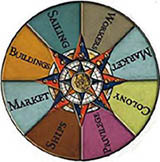 The round is marked with the orange ship, which is placed on the rondel at the current position of the new owner at the moment when he receives the card. If he again enters or passes that field without using the card, it is given to the player on his right, and the ship on the rondel is moved to the new owner's current position on the rondel. In the situation shown here, yellow should use his card before his turn, otherwise the Navegador card would expire. or after the last building has been taken. After the game end has been triggered in one of those ways, each player, including the one who triggered the end, takes a single final turn and then the game ultimately finishes. 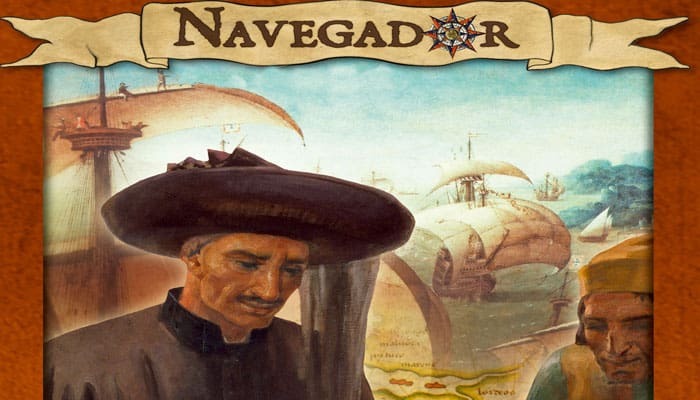 If a player explores Nagasaki by use of his Navegador card, he may take his regular turn and only after that every player, including himself, executes his final turn. Each player uses his game stone taken from the rondel to count his final victory points (VPs) on the scoring track running around the game board. he player with the most VPs wins the game. A possible tie is won by the player who currently holds the Navegador or, if not the case, who is the next player who would receive him. Each player receives 1 VP per his worker in Lisboa, ship on the game board and full amount of 200 Cruzados cash. After that the player sheets are evaluated. Each sum inside the 5 columns, where the numbers already printed on the player sheet are counted as well, is multiplied with the number of the corresponding achievements. In the situation shown here, every colony counts as 4 VPs, every factory as 2 VPs, every explorer as 5 VPs, every shipyard as 7 VPs, and every church as 5 VPs. Before calculating the final results, each player places his King's privilege on a free position inside his player sheet, but without receiving the related cash bonus. The King's privilege counts as a privilege of the chosen type: 2 VPs per shipyard or church, or 1 VP inside one of the other 3 columns.